Run Jen Run: See Ya 2016! 2016 hasn’t been my best year. There were ups and there were downs but I like to think I am ending the year on a high note—I mean I did just win my Fantasy Football League after 5 unsuccessful years with my friends. I kicked off 2016 on injured reserve (hamstring) and ran the first 18.6 miles of the Houston Marathon then walked the final 7.6 miles. I was so proud of my cousin for running her first half marathon and the post-race burritos and guac never tasted so good. I took some time off after Houston but traded in my Nike GPS watch for a Garmin Forerunner 230 in February to re-motivate. I turned the big 3-0 on March 18th. It was pretty traumatic for me and to top it all off, my Papa passed away on my birthday. April was a pretty good month. I got the chance to interview Meb Keflezighi, ran a 10k PR at the Cape Cod Beer Race to the Pint and took Georgie out for her longest run ever—4 miles! 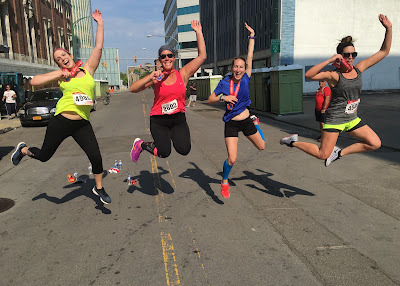 I trained for the Buffalo Half Marathon in May and was pumped for the chance to run a PR in my favorite city with my cousins but I got injured 2 weeks before the race (posterior tib) and we experienced record high temps for Memorial Day Weekend in Buffalo. Side note: I WILL be back in 2017 for redemption and another PR attempt. In June, I healed up then Georgie got injured. The vet diagnosed her with a shoulder sprain and was on strict rest for about 2 weeks. She also had a giant open wound on her head so the vet shaved her head like Britney Spears circa 2007 and she rocked the cone for a while. July was really hot. Like really hot. I ran the Runner’s World Classic with some of my best running buddies and had a fun girls weekend off cape. I got injured again in August (Achilles) and had to miss the Falmouth Road Race. 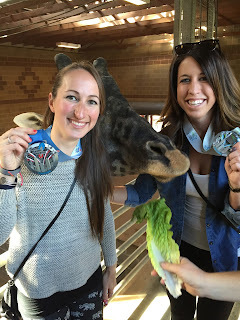 I did attend the mile and had a blast crashing the after party with some of old office staff and Anchor Boothed with some Olympians. September I celebrated my 3 year blogiversary and shared 25 Things About Me. Georgie chipped a bunch of teeth, cut up her lip and re-sprained her shoulder. I started training for the Miami Marathon in October and also started running with Georgie again because for the first time in months we were injury free at the same time! I traveled to Durham, NC for my cousin’s wedding in November and really started to rack up my mileage. December was filled with lots of holiday cheer and many miles including an 18-miler on the treadmill at Mashpee Fitness. 985 total miles in 2016.